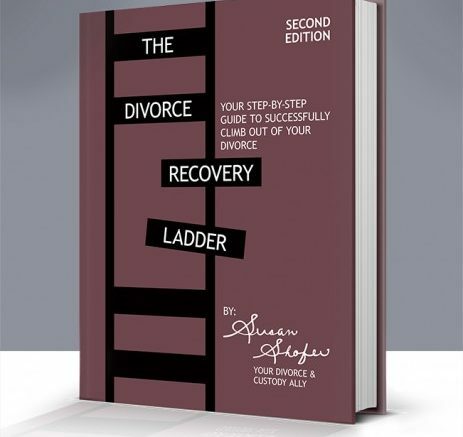 Baltimore, MD – Announcing the release of The Divorce Recovery Ladder: Your Step-By-Step Guide to Successfully Climb Out of Your Divorce, by Susan Shofer May 1, 2019. This book is a comprehensive guide for people who are dealing with a difficult or even toxic divorce. In it, Susan Shofer is their ally, helping to navigate each step. This is the second edition, with even more expert advice and information than the first. “As one who has experienced divorce and its litany of struggles — including many portrayed in the book — I read The Divorce Recovery Guide and found myself asking, ‘Where was this book when I needed its wisdom?’ Not only is the book packed with sensible, specific and well-heeled information and guidance on every aspect of the process, but Susan Shofer goes above and beyond to dive into the emotional turmoil surrounding many divorces — and the problems that often creates. Written with both compassion and strong, sage guidance, The Divorce Recovery Ladder Guide might be the greatest investment one can make during a divorce… outside of hiring a good attorney, of course.” — Robert Yehling, author, Crawl of Fame and Just Add Water. Susan Shofer will be at the LA Times Festival of Books promoting the book’s official launch. The largest book festival in the United States, the festival draws in 150,000 people to the USC Campus each year. Shofer will be signing copies of the book in the Black Château and Books That Make You booth, number 956 on Sunday, April 14th between 11am and 1pm. The Divorce Recovery Ladder: Your Step-By-Step Guide to Successfully Climb Out of Your Divorce is now available for pre-order. Find it on Amazon. Susan Shofer is known as a divorce and custody ally because she understands the difficult journey people take when facing divorce. She is an agency-licensed private investigator who turned into a divorce consultant after her own high conflict divorce. As a divorce survivor, her firsthand experience means she knows what it feels like when encountering the many perils of divorce, including successfully circumventing parental alienation. Shofer consults with attorneys, parents and legal professionals, and is a sought-after public speaker. Learn more on her website: SusanShofer.com. Be the first to comment on "Divorce and Custody Ally, Susan Shofer, Promotes New Book at LA Times Festival of Books"